We recognize that our clients go into business for a variety of reasons. It may be for the love of their craft, to obtain control over their work/life balance, to choose whom they serve and work with, or to support the community. One thing they all have in common is an entrepreneurial spirit and technical expertise. But in the most successful businesses, a third element exists, the one many business owners struggle with: strong management. In other words, due to the demands of working in their business, there is no time to work on their business. As a business owner, you have already invested much into achieving where you are today. We want to partner with you to ensure that you not only accomplish your immediate goals but also reach your full potential. Since 1955, Eckhoff and Company has served the community as a full service certified public accounting firm. Over the years our clients have called upon us to help with a myriad of business management concerns that fall outside the scope of our traditional services. As CPAs and advisors, we are uniquely qualified to help business owners measure and manage their business performance. We have the training, the tools and the model to provide cloud based oversight, value-added perspective, and critical decision support. Whether you seek tax and accounting services, wish to explore the financial health of your company, or need to set goals and determine metrics to measure your success, our team of professionals is here to serve you. You bring the heart, spirit, and technical expertise of your business, and we bring the skills and knowledge to help you understand the present and focus on the future. We are on your team; partners in your business success. Strong businesses = strong community. Visit our website and meet our team! In her spare time Janina helps her husband make wine from their own tiny vineyard. Janina, Carolyn, and Larry enjoyed speaking with attendees of Sonoma County Vintners Annual Members Meeting. We don\'t just serve the wine industry, some of us make wine! Janina Thomas and her husband Dave receive a bronze award for their 2013 Estate Malbec. But a frequent and obvious question is “what does ‘ready’ mean; how do we define ‘ready’?” That seemed like a simple and obvious question that deserved an answer. So the folks at EPI put together a set of 10 simple statements to help owners determine what they need to accomplish to be prepared or “ready” to transition their businesses. • Threaten to immediately bring in local police or other law enforcement groups to have you arrested for not paying taxes you owe. Remember, the IRS will typically mail you a bill if you owe any taxes. It doesn't initiate contact with people via email or texts. 1. Review your business insurance coverage. Don't just automatically write a check to renew your insurance policies when they come due. Instead, you should sit down with your insurance agent every year. Review your business operations, focusing on any changes. Discuss types of risk that could arise. And ask about new developments in business insurance. 2. Look at your business tax strategy. Consider adjusting taxable earnings for the year, perhaps by accelerating expenses or delaying income at year-end. If you're a cash-basis taxpayer, you could boost 2017 deductions by declaring and paying bonuses in December rather than in early January. Also, you may be able to defer invoices or make early purchases to reduce your 2017 tax bill. 3. Survey your customers. An annual customer satisfaction survey is a great way to assess performance, get insight on potential new products or services and to let your customers know how much you value their business. 4. Determine your marketing effectiveness. Are your current methods and channels working well, or are you simply doing what you've always done? 5. Update succession planning for your business. Review your succession planning annually. You should have a specific plan for each key manager position, including yourself. Be prepared for a short-term absence or a permanent vacancy. Your plan may include promoting from within or recruiting externally. 6. Review your business banking relationships. Every year you should go over your cash balances and banking relationships with your controller, CFO or accountant. Then meet with your banker. Ask about new products or services that could help your company. Address any service concerns or problems you might have had. And look for ways to boost interest earned and improve cash flow. 7. Update your personal estate planning (if needed). If you're a business owner, your company is likely to be a significant part of your estate. Your company, your personal circumstances and the tax laws are continually changing. You should take time each year to make sure your plans are current. If you are serious about improving your business, consider a yearly assessment of your operation. Give us a call to learn more about how we can help with the growth of your business . President Trump declared that a major disaster exists in the State of California because of the fires that began on October 8, 2017. Individuals and businesses located in the North Bay Counties that have been declared a disaster area may be entitled to government disaster assistance. The links below will take you to information regarding certain of the programs. You can also reach us in our San Rafael office at 415-499-9400 or email eac4sonoma@eckhoff.com with your questions. You may be entitled to a casualty loss on your personal or business tax returns. A taxpayer can claim the loss on their 2017 tax returns or amend their 2016 returns. 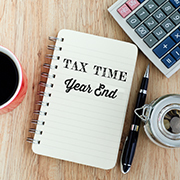 Amending your 2016 returns would accelerate any tax benefit from your loss. Victims of the wildfires that took place beginning on October 18, 2017 may qualify for tax relief from the Internal Revenue Service. Details of the relief from filing due dates of certain returns and postponement of certain tax payments can be found on the IRS website. The State of California has made similar tax relief provisions. California provides that if a major calamity such as fire, earthquake, or flooding damages or destroys your property, you may be eligible for property tax relief. This property tax relief is available to owners of real property, business equipment and fixtures, orchards or other agricultural groves, and to owners of aircraft, boats, and certain mobile homes. There are several loan programs that can help in the rebuilding of your business. The following are two of the programs. SBA makes physical disaster loans of up to $2 million to qualified businesses. These loan proceeds may be used for the repair or replacement of real property, machinery, equipment, fixtures, inventory and leasehold improvements. USDA offers a variety of programs and services to help communities, farmers, ranchers, and businesses that have been hard hit by a natural disaster. Expense or capitalization, it’s a confusing question even for professionals! Does your accounting staff know what qualifies as anexpense and what must be capitalized under the Tangible Property Regulations [Treasury Decision 9636]? Under the Tangible Property Regulations, large expenditures for work done on a building, previously considered to add capital value to the building, now may be considered a repairs and maintenance expense. The Tangible Regulatory Regulations create significant changes Knowing when to realize an expense instead of an expense capitalized over a period of years can be very beneficial to the taxpayer. Businesses can lose significant tax breaks when decisions are made based on out dated information. The IRS deemed these changes as mandatory and misclassifications could open taxpayers up to losing some tax benefits altogether. To learn more, or if you would like help reviewing your situation and how best to handle these expenditures, contact our office. Do You Have a Code of Ethics Policy for Your Company? Ethics, acting in accordance with the rules or standards of a profession. Business owners need to trust their sales people as the “face” of their business and as a positive brand ambassador. On the other hand, customers rely on sales professionals to be trustworthy, to hold themselves accountable, and to add value to their business. Salespeople are under a separate set of pressures from their managers to maximize sales and obey regulatory rules. These demands can feel contradictory and put sales professionals in situations where they must make judgments on complex ethical dilemmas. Having a code of conduct policy for your sales professionals protects your business, your customers and your sales professionals. 1. Commitment to maintain the highest standards of integrity in all business relationships. 2. Provide customers with a buying experience where “the right thing is done and thereby getting the right results”. 3. Promote and protect good sales practices. 4. Always act in line with the organization’s codes and regulatory laws. For a thorough business evaluation, call Eckhoff and Company. We offer business consulting, wealth management, transition planning and tax services. There May Be USDA Grants Available For Vineyard Growers! There are many reasons why a vineyard or grower business may need additional funding and if you qualify for a grant that you don’t have to pay back, that’s even better. Farm Service Agency (FSA) provides several different loan programs, guaranteed and direct, that range from farm ownership to operating loans. FSA has specific loans for youth, beginning farmers and ranchers, socially disadvantaged farmers, and emergency loans. Many of the loans can be used to improve or construct facilities and purchase equipment. The Specialty Crop Research Initiative (SCRI), which is administered by USDA’s National Institute of Food and Agriculture (NIFA) was established to solve critical industry issues through research and extension activities. Projects must address one of five focus areas: 1) Research in plant breeding, genetics, and genomics to improve crop characteristics; 2) Efforts to identify and address threats from pests and diseases, including threats to specialty crop pollinators; 3) Efforts to improve production efficiency, productivity, and profitability over the long term; 4) New innovations and technology, including improved mechanization and technologies that delay or inhibit ripening; and 5) Methods to prevent, detect, monitor, control, and respond to potential food safety hazards in the production and processing of specialty crops. Accurately recording and accounting for grant funding may be tricky for the average owner who specializes in vineyards and growing. For tax preparation, bookkeeping, business consulting and wealth management, contact us to see how our services may be able to benefit the operations of your business. For tax preparation, bookkeeping, business consulting and wealth management, contact us to see how our services may be able to benefit the operations of your business. Are You Looking For Bank Financing? When serving our clients, EAC often interacts with banking professionals, specifically in the lending and business development departments. Recently, we asked our various bankers to consider what service our firm could provide that would have the greatest impact on our mutual clients. The answer every time: Accurate and timely accounting records. While processing loan applications, lending departments request accounting records for periods that should be closed and readily available. Applicants often take months to provide this information. Untimely financial records are a red flag to banks; creating the question as to whether the business has adequate and necessary accounting processes in place to successfully pay back a debt. Every industry and business has its own story, told through its financial reports. When wineries seek loans, inventory value is an important number for lenders to understand. One of the many factors that go in to the final inventory value on the winery balance sheet, is wine costs. Reporting accurate wine cost as a part of the inventory value is complicated. Financial accuracy in a business’s accounting records is something a bank reviews when considering a loan for a wine industry business. Accurate and timely account reporting shows a potential lending department that business owners understand the importance of the information. It also suggests that the owner is using this timely and accurate data as a strategic planning tool, used to grow and improve the business. Do You Know The Exciting News About AVA? An American Viticultural Area, or AVA, is a distinguishable geographical grape-growing region defined by the federal Alcohol and Tobacco Tax and Trade Bureau. There are many regions and wine types available to consumers and labels are often the recognizable differentiator used in their wine-selection process. Grapes and wine from well-known AVAs can command a significanlty higher price compared to their non- AVA competitors. In October 2010, the IRS approved the right to use an AVA designation upon the purchase of a vineyard, like a license or permit. Under Section 197, this allowed the owner the ability to amoritize the AVA asset over a period of 15 years. Owners with vineyards located in a desirable (AVA) have a distinct tax advantage. And while the news of an AVA deduction isn’t new, there are still vineyard owners unaware and therefore not benefiting from this tax benefit. The exciting news? Taxpayers who acquired vineyards after the enactment date (August 10, 1993), who did not separately allocate value to existing appellation rights, may qualify for an automatic change in their method of accounting. This change would allow a taxpayer to deduct, in the year of the change, the entire balance of accumulated amortization related to the appellation right –realizing all missed deductions of prior years. The remaining unamortized amounts would be available for amortization for up to 15 years. Call us with your questions! Let’s discuss your options and all tax benefits available to you. Eckhoff and Company (415) 499-9400. The Tax Exemptions and Benefits May Make Being Considered A Manufacturer By The IRS Worthwhile! As you know, California is the largest wine producer in the United States, while coming in as fourth in the world. As a winemaker or vineyard operator, there are tax exemptions that you may not be realizing. Taking the time to consult with a tax specialist to make certain you are optimizing the tax code rules to your benefit would be in your best interest. Although not a term of endearment in the industry, technically speaking winemakers are considered manufacturers by the IRS. To be considered a manufacturer, you must transform one product into another; grapes into wine. Utilizing the IRS classification of manufacturer, you may qualify for a partial exemption of sales and use tax on your equipment purchases and leases. If you are a vineyard operator, you may qualify for partial tax exemptions on farming equipment purchases. The ingredients and products used in making the winemaking process are considered food products intended for human consumption and are not subject to tax. Raw materials, that are purchased as non-food ingredients to winemakers used in creating the finished product are not taxable items. Manufacturing aids are taxable items if the purchase of those items is not physically incorporated into the finished wine product. Important Note: The application of tax for the ingredients and products listed on the BOE website is based on their use in winemaking as described in the Code of Federal Regulations (CFR), Section 24.246, Materials authorized for the treatment of wine and juice. If the actual use of a product or ingredient is different than its described category on this page, (as it aligns with Section 24.246 of the CFR), then you may not rely upon the stated tax application for your purchases of the listed ingredient or product. Please contact Eckhoff and Company (EAC) for help in determining the tax benefits specific to your business. Enlist EAC as your tax expert so you can concentrate on the making of great wine. Eckhoff and Company has formed a strategic partnership with Eckhoff Wealth Management, LLC. The unique services available to you by the alliance of these two companies is undeniably beneficial. Please contact Eckhoff and Companies to discuss your tax, business transition, employee retirement investments and financial planning needs for your business and well as for yourself. ﻿Winemakers Help Determine the True Cost of Wine! Winemakers know exactly what goes in to making each varietal and lot of wine, thus they play an integral role in determining the true cost of that wine. The winemakers record keeping is not only important to determine the formula of each great wine but also to determine the true cost of all wine produced. Typically, wine and production cost processes are developed slowly over time, by using direct cost expenses such as; grape and bulk wine purchases, custom crush fees and bottling costs. These expenses are the most easily identified for accounting and tax purposes. What is often missed in creating the real cost of wine are the calculations of indirect cost expenses like; yeast and nutrients, fining agents, lab fees as well as wages, payroll and property tax, depreciation, rent and utilities, etc. When winemakers use the art of blending lots during production, additional tracking is needed to determine the real cost of wine. Why is it so important to get the true cost of wine right? When wineries reach a revenue threshold of $1 million dollars or more, it is critical that the business realizes both the direct and indirect expenses to keep tax liability and accounting expenses under control. Pricing the wine at its true cost + profit, ensures that the direct and indirect expenses are covered in the final sales price. To learn more about how to avoid the surprise of a significant tax bill or in organizing your record keeping making determining the true cost of your wine more manageable, contact Janina Thomas at Eckhoff and Company (www.eckhoff.com). As a smart Sales and Marketing Executive you already know that growing the firm and increasing the profitability through sales helps grow the business which builds your career and wealth at the same time. But do you know the cost of each customer acquisition and why knowing that is important? Tracking sources of income and the cost centers associated with that income helps you and the owner understand the real cost of each customer acquisition. Targeting sales efforts towards the customer base with the lowest cost of acquisition is a key way to increase business profitability, which circles back around to help build your wealth too. Now that you are well on the way to building your own wealth and legacy, we’d like to encourage you to strategically plan for your future. It’s been our experience that successful executives are so busy creating income that they far too often overlook the need and benefit of creating their own financial plan. Without a plan, you can’t get there from here. Do your personal financial planning work now to feel safe and secure in your future. Take full advantage of the all employee benefits. Make sure you’re not over exposing yourselves to liability and creditors. Make sure you and your family are protected through proper insurance strategies. Work with your expert team of advisors (CPA, CFP®, JD) to help you develop, implement and monitor a plan that’s right for you and your family. Bruce Frankel, Michele Hassid and Eric Briese, are excited to announce their strategic and innovative joint venture! An exciting new business enterprise, providing the professional expertise of CPA’s and CFP®’s all under one roof. This Strategic partnership, the brainchild of both Bruce and Michele creates an extraordinary “one stop” experience for wealth, estate and tax planning. Clients benefit from a truly comprehensive integration of a tax and financial advisory experience. We are excited to invite you to our new Workshop Series, designed specifically for Business Owners and Entrepreneurs. This Series promises two evenings of invaluable information … and good food. Join us to learn how to keep more of what you earn. Space is limited – Register now to ensure a seat at the table! Investment advice offered through Yerba Buena Advisory Group, LLC, a Registered Investment Advisor. Tax and Valuation Services Offered by Eckhoff and Company. all applicable to firms at any stage of development. Attend one or attend them all. Any Business Owners or Executives of businesses with over $500,000 in net income with a desire to take action to optimize their financial situation, and/or businesses transitioning within 5 years. Investment advice offered through Yerba Buena Advisory Group, LLC – a Registered Investment Advisor. Financial management techniques, tax laws and wine industry accounting are an ever-changing and sometimes confusing element to the wine industry. This educational seminar will communicate topics that often take winery and vineyard owners and financial managers by surprise. These topics will be covered from an overview standpoint and our goal is to increase general awareness of these subjects. In addition, follow up seminars will be developed to address specific financial areas of interest and need based upon participants requests. Winery and vineyard owners, General Managers, CFO’s and anyone who has the responsibility to optimize your business's financial and tax situation with production between 1,000 and 50,000 cases. Individuals seeking to ensure they have knowledge of the finance and accounting topics specific to the wine industry. The end game for your wine business. Why are you working so hard? IRS Audit Guide - "The Old Testament" ï§ What do they know about the wine industry? ï§ What might they expect from you? Thursday, July 7 from 9 - 11:30a.m. Please RSVP by Friday, July 1. For more information and to register, please contact Michael Haney, Director of Membership. In February we began a five part introduction to the evolution our firm is undertaking. This issue will introduce level 4, the next step in our Level 5 Decision Support model. Level 4 takes our client's vision developed in level 3 and translates it into day-to-day activities and their associated Key Performance Indicators. Each of these perspectives of measurement is derived from facilitated processes. In fact, the majority of Level 5 Service is about facilitating activities that engage the native wisdom of the organization. In other words, we don't go in with the answers, we ask the right questions that will help our clients and their team reach the answers on their own; a very Socratic approach. Ideal Outcome: Facilitate a situation that allows our clients to develop and/or advance the team's business acumen needed to continually improve overall performance within their organization. Once we've helped the team identify the measures that support the goals and strategy of the organization, we're ready to set up custom dashboards throughout the organization. Our goal is to create feedback loops providing line of sight accountability for everyone in the company. Custom dashboards limit the feedback for each level to their areas of direct stewardship. A strategically intelligent employee is focused on not only doing things right, but also doing the right things. Employees are continually looking for ways to improve company outcomes. Employees that understand how their behavior impacts company goals and, armed with that intelligence, are empowered to reengineer their work processes to achieve optimal performance. Employees know how to rearrange their priorities based on the strategic priorities of the organization. Employees come to work each day to grow the company, not just perform a series of tasks. If you would like to hear more or discuss how these services can benefit your company, contact Janina Thomas, Larry Cunha, or Michele Hassid at (415) 499-9400. You are invested in seeing your company grow. We are committed to challenging you to reach your potential. Together we are seeing our community thrive. Janina joined our firm in 1996 and has built long-term relationships with Bay Area business owners from a wide range of industries through tax and accounting services including financial statement reviews and compilations. She has years of experience implementing efficient business processes and information systems with a focus on quality control and employee training and development. Janina is using her years of experience to expand the company's focus on management advisory services to help business owners identify and monitor activities that are critical to success. For enjoyment, Janina and her family raise small animals on their family farm for 4-H and Future Farmers of America. Additionally, she and her husband cultivate Malbec vines to make wine, and they produce a variety of award-winning wines from the fruit trees on their property. Larry has been with the firm for over 40 years working with clients to meet both their tax and accounting needs. In addition to providing excellent traditional services of a certified public accountant, Larry is considered, by those who work with him, to be an expert in process design and developing the most efficient workflow design both for the firm and our clients. He works tirelessly to find the best software and network solutions required to provide effective and consistent methods to supply our clients' needs. Larry's drive to continue learning new and improved ways to serve our clients has recently led him to obtain certifications from Sonoma State University in both Direct to Consumer and Wine Industry Finance and Accounting. When Larry isn't in the office, the first question anyone asks, "Did he and Laraine (his wife) go to the (SF) Giants game?" Michele is the current Managing Partner of our firm. It is her responsibility to ensure that we continuously strive to bring innovative solutions to our clients, serve as our clients' most trusted advisors, and train and develop our staff and future leaders to earn the reputation as the CPA firm of choice in our community. In February we began a five part introduction to the evolution our firm is undertaking. This issue will introduce level 3, the next step in our Level 5 Decision Support model. Level 3 focuses on evaluating how the client's business measures up according to the 7 Stages of Business Growth, helping our clients clearly articulate their vision, and planning for the future of their business. We start with a process called the Business X-Ray. This is a series of assessments that involve the owner and management team. We ask a number of questions to which the answers provide a snapshot about the owner's leadership and management style, and how they are navigating through the challenges of growth. Business failure rates are published by various sources ranging from the IRS, Forbes, Fortune, Bloomberg, etc. While the resulting information from these sources differ somewhat, there is a common theme: People invest all they have, mortgaging their future to fund and pursue their entrepreneurial dream and the vast majority fail due to lack of focus on where they are headed and why. Once we've completed the X-ray, we conduct a planning session that includes a SWOT Analysis (Strengths, Weaknesses, Opportunities, and Threats) and develop an action plan that will get our clients to their desired outcome. To ensure we maintain a balanced approach to measuring and managing the performance of the company, we use the $COPE model. It focuses not only on financial performance but takes a more holistic approach. $ = Financial: This covers everything from accounting and collections to managing the financial assets of the organization. However, if we want to go beyond just measuring financial outcomes to actually improving them, we have to focus on the people and processes that drive those outcomes. We find these factors in the balance of the $COPE model. C = Customers: This covers all aspects of marketing and sales, as well as ongoing customer service and retention. Customers hold the keys to a company's success. By examining customer interactions, we can optimize and leverage every point of contact. We help our clients establish key performance indicators (KPIs) for monitoring and improving their cost of customer acquisition, lifetime value, attrition rates, customer satisfaction, marketing effectiveness, referrals, etc. O = Operations: This covers everything involving the creation and delivery of products and services. We measure utilization rates, productivity, efficiency, scrap, waste, throughput, cycle time, rework, call backs, quality, etc. P = People: No business can succeed without the right people. A clear understanding of the roles and behaviors of employees helps determine if the team is supporting the organization in achieving its objectives. We help our clients measure employee engagement, training effectiveness, management development, hiring effectiveness, retention strategies, and so on. E = End in Mind: We look at the owner's business and personal goals to make sure they're in alignment. In some cases, we might do a business valuation and some personal financial planning to make sure clients have a clearly defined path to achieving their goals. Ideal Outcome: Our goal is to facilitate the articulation of our client's vision for their future, assess the current state of the organization, and create an action plan that closes the gap between the current state of the company and where they want to go in the future. With this clear vision of where a business is headed we can move into level 4 which we will introduce in our next newsletter. In the last issue of our newsletter we began a five part introduction to the evolution our firm is undertaking. This issue will introduce level 2 of our Level 5 Decision Support model. Financial statements reveal the efficacy of the business decisions made throughout a company. Typically, people think of financial statements as only important to owners and managers. In the case of Level 5 Service, we seek to raise the financial and business fluency team-wide. Ideal Outcome: To provide every manager and employee with line-of-sight feedback about their performance. However, feedback without a proper context and understanding does very little to advance their fluency skills. Our goal is not to simply measure the performance of the company, but to stimulate it. This requires that employees have a clear understanding of how their day-to-day behaviors impact company outcomes. Level 2a begins with improving understanding of the fundamentals of financial statements from defining terms to showing the link between critical business drivers and financial outcomes. Ideal Outcome: Currently we use charts and graphs as a supplement to financial statements and in certain cases industry statistics are used as performance benchmarks. We can now go much further. With a one page financial dashboard we can give owners and managers a new perspective on the three bottom lines in business: Net Profit, Return on Investment, and Operating Cash flow. It answers the often-asked question, "If I made a profit, where's my cash?" Our goal at Level 2b is to help clients think through the implications of their management decisions. We can also "stress test" the business by modeling worst-case scenarios. This helps clients cut through the issues to focus their energies on the 20% of issues that are impacting 80% of outcomes. We can also benchmark the client's best outcomes over several years and compile them into a single scenario. This is a very powerful way of setting goals for the future based on previously achieved outcomes. The key is hitting all the best numbers simultaneously rather than haphazardly over time. This lays the foundation for the planning we will do at Level 3 which we will introduce in our next newsletter. Over the next five newsletters we will be introducing the five levels of decision support our firm offers to those businesses that are ready to take up this challenge. All companies need solid bookkeeping, accounting and tax services to address both the compliance and management needs of the business. At Level 1, accountants provide a foundation for a more accurate and more relevant assessment of the company's financial standing. Our objective is to add value to traditional services by organizing information to provide greater insight about the performance of the company by department, product, and/ or services. By conducting a chart of accounts analysis, we can improve how information is organized in the general ledger. Ideally, we can then produce custom reports that can be fed into company dashboards. Through getting the numbers organized for greater management insight, we can then differentiate commodity services. This lays the foundation for thorough analysis at Level 2. Look for information on Level 2 decision support in our next newsletter. If you would like to hear more or discuss how these services can benefit your company, contact Janina Thomas, Larry Cunha, or Michele Hassid at (415) 499-9400. Link to Performance – Goals are met based on critical activities performed in your business. Measures are developed for these activities and provide feedback to key people on the status of those goals. Continuous Improvement – All growth needs to be nurtured. As your business goals are met, new goals must be set.